At North Vancouver Recreation and Culture, we are committed to improving accessibility for people with disabilities. We have developed the following Adapted Programs in response to this need, and welcome your feedback and suggestions on how to enhance and expand our course offerings. Email us with your comments and suggestions. North Vancouver Recreation and Culture (NVRC) summer camps welcome children with disabilities. Limited support options are available. Read more. Are you living with a disability and require continuous support in order to access recreation programs and services? 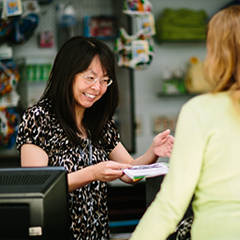 When you participate at any North Vancouver Recreation and Culture facility, your support person is admitted free of charge as long as they are there to assist you. Your support person can be an adult friend, sibling, volunteer or private aide. When participating in our programs and services, please ask your support person to let the front desk staff know that they are there to assist you. Participants with developmental or physical disabilities will help design their own basic personal fitness program and learn how to use the Fitness Centre equipment safely. For more information, please contact Darrin Jones at 604-983-6559. Individuals requiring 1:1 support, please provide your own Support Worker. For more information or to register, visit the Canucks Autism Network website or call 604-685-4049 extension 201.